The Shannen’s Dream Club at Pierre Elliot Trudeau School in Gatineau, Quebec, consists of students aged six to fourteen years old. Students at Pierre Elliot Trudeau School became aware of “Shannen’s Dream” in the spring of 2011 and have been learning and actively educating others ever since. The club has made a commitment to standing up for First Nation, Inuit, and Métis children in Canada because they have a strong belief that all children deserve to grow up happy, loved, and in their own communities. They gather once or twice a week during recess to discuss current issues facing Indigenous children in Canada. The students work together to overcome personal and group challenges and together learn more about issues by asking questions, conducting research, making partnerships, preparing presentations and travelling to give presentations and inspire others. 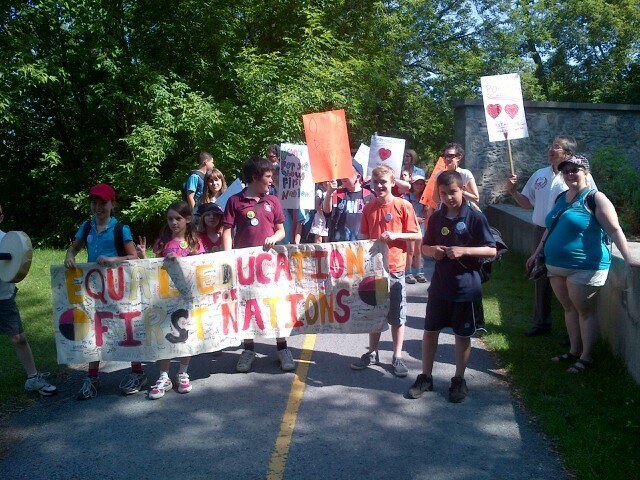 The class has been described as a “hopeful beacon for the future of advocacy for FNIM [First Nations, Inuit and Métis] children.” They have delivered speeches at local elementary schools, given workshops for adults at the Adjudication Secretariat for Residential Schools, given presentations at the Truth and Reconciliation event in Montreal and a Canadian Teachers’ Federation conference in Ottawa and some of the students have also had the opportunity to visit Fort Albany to see firsthand what is like to grow up on a reserve. In addition to the many presentations they have given, the students in the Shannen’s Dream club believe on acting on what they have learned as a club to make a difference. The students have been on Parliament Hill rain or shine to participate in child-led events and promote the importance of what they believe in and their message with others. The students believe that it is their right and responsibility to do something about what they have learned by trying to make and promote change and to inspire others to do the same.